I absolutely LOVE fish tacos. In addition to dining on them at restaurants, I’ve made them many times. I wanted to try something a little different, though, so I visited some blogs and found some inspiration from Cheap Crafty Mama. Earlier this week, she posted a recipe for Cheesy Fish Tacos and I got my inspiration from that exact recipe. Of course, I made some alterations, but overall, I kept the recipe pretty much the same. Please enjoy the recipe. 5. While the tilapia is baking, prepare your cream sauce. Place cilantro, lime juice, mayo, sour cream, pinch of salt and garlic into a food processor. Grind until well mixed and the cilantro is chopped into small pieces. 6. Remove the fish from the oven when done baking break into pieces. 7. 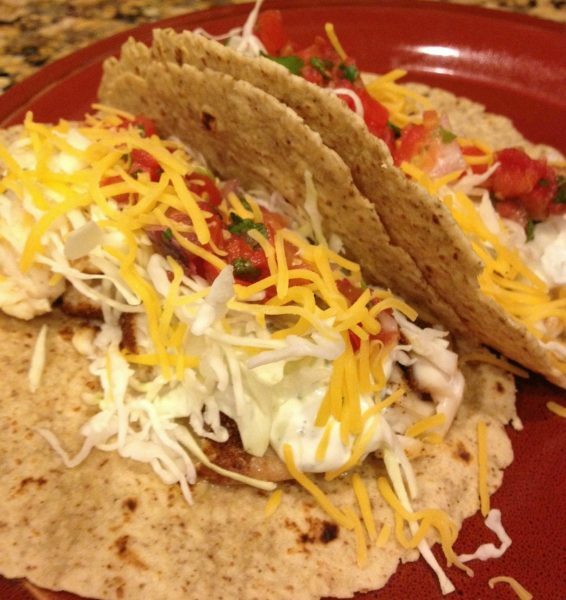 Garnish with cilantro cream sauce, shredded cabbage, shredded cheese and salsa or pico. « Previous PostAwesome Giveaway Via Our Homemade Happiness! Great recipe! I love fish tacos too, but I don't think I've ever made them for my family. Thank you for sharing. I appreciate your visit to my blog.